Don’t Get Around Much Anymore is the fourteenth installment to the Stardust Melodies Crochet Along. 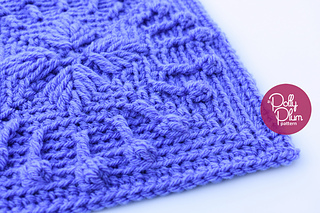 The pattern is exclusive to the eBook as is the accompanying video tutorial. Join us for a crochet along where we delve into fun textures we can create with our hooks and just one color of yarn at a time.The Stardust Melodies Crochet Along hosted by Polly Plum began on May 18, 2017. The event consists of 24 texture rich afghan block patterns - 12 of which are free and available on everytrickonthehook.com and 12 that are paid and available here on Ravelry in the Stardust Melodies Crochet Along eBook. All 24 squares are included in printable PDF form in the eBook. Make some of them or make all of them! 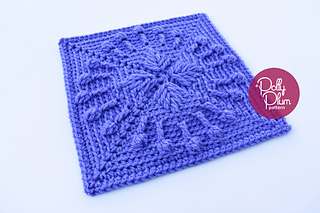 This crochet along is incredibly flexible so that you can make an afghan that’s just right for you. 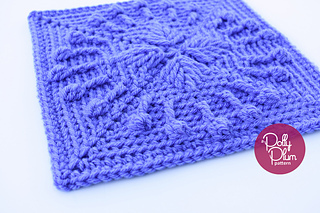 Any yarn and appropriately sized hook can be used to make this pattern but you will get a different size square. Please visit everytrickonthehook.com for more information about this pattern and how to use it and how plan your own afghan. Visit me, Polly Plum, get help or support, and stay up to date on new patterns by: checking out my website, everytrickonthehook.com, for things like tutorials and free patterns; liking Every Trick on the Hook on Facebook; following polly_plum_crochet on instagram; visiting Polly’s Place on Ravelry; or get lots of help and support from the Facebook group, Polly Plum Pattern Posse. You can see all of my patterns on my designer page on Ravelry.